This May, I was fortunate enough to be selected to participate in the Bard-Japan Farm Exchange program in Honbetsu, Hokkaido, Japan and receive a grant from the Henry Luce Foundation. As a student currently studying Philosophy and Music, I never thought that I would have the opportunity to work full-time on a farm in Japan for half a month. Life at Sophia Farm Community was tiring but exciting—I met a lot of friendly people with interesting stories and learned much about biodynamic farming. Ben and Konomi Campbell are the hosts of the farm. They provide accommodation and meals to volunteers, treating each volunteer like a member of their family. Every day we woke up at around 5 AM, but if someone wants to milk the cows, he or she needs to get up at 4 AM. Breakfast starts at 7:30, before which we would read poems and meditate briefly hand in hand. Konomi and Ben arrange our work according to a biodynamic calendar, which tells us if it is a flower day, a leaf day, a fruit day, or a root day. For example, on root days, we weeded root plants and on flower days we collected flowers. Sometimes we also water the plants, chop wood, prepare wood, collect vegetables, make garden beds, and feed animals. The most exciting day is “hay day”, during which we lift and move cubes of hays (more than 10 kilograms) made by a machine on Ben’s truck. We then put the hay on another huge truck (whose wheels were as tall as my shoulder!) and tried to fit in as much hay as possible. Later, we stored the hay in piles in the barns and went back to collect more hay. Usually after a “hay day” we would be tired and dirty, so Ben would take us to the hot springs nearby. The best time of each day was in the evening. After a whole day’s work, we would stay in the kitchen, talk a lot, and play music. When the midsummer wind blew in, I felt extremely peaceful and relaxed. A Japanese young man was really into playing the piano, I also practiced some of my piano pieces, and a 12-year-old Taiwanese boy brought his violin. I was surprised and quite delighted that almost everyone could play some instruments or at least know some about music. I felt that the communication between each volunteer and host was even stronger because of music. The volunteers were from different parts of the world, we share our experiences and exchange cooking skills. Although sometimes the communication was not easy, we tried to help each other. 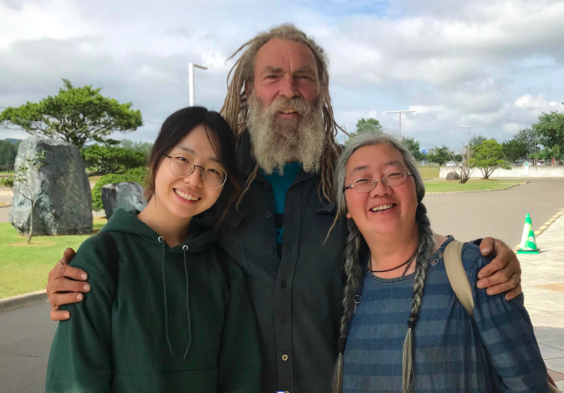 I learned a lot from the volunteers and Konomi and Ben, their stories were really inspiring and made me realize that there were many other ways to live a life. I would like to thank Professor Nathan Shockey, who gave me this chance and offered so much help on applying for my Japanese visa. Also, thanks to Bard Center for Environmental Policy and the Henry Luce Foundation, without them I could not have had this wonderful experience.